for anyone wanting a nespresso vertuoline machine produced coffee, but wants the liberty to using their own coffee (for hashgacha, preference or price), I highly recommend using this refillable product/technique i found on Amazon. Have been using for 2 years now and its worked like a charm! it does look like a lot of work. However I don't use the foil tops, just the plastic and a filter. Since i reuse the same capsule for a few months the whole process is super fast and easy. Takes me 30-45 seconds. And the results are identical. So is the consensus that Nespresso pods are better than 3rd party such as Bestpresso or Toast Coffee (assuming shipping is not prohibitive)? Until recently, yes. However Peet's has released aluminum pods (very important IMO) that have gotten very good reviews, many reviewers saying its on par with Nespresso. The only problem is they're priced the same as Nespresso, however they do have some good deals on Amazon from time to time. *40% off select Nespresso® Original coffee machines (“Offer”). Machines included in offer are Expert, Expert Bundles, Lattissima+, Lattissima One, Lattissima Touch, Lattissima Pro, Creatista Uno, Creatista, Creatista Plus, KitchenAid and KitchenAid bundles. Offer valid for purchases made between February 7, 2019 through February 14, 2019 by 11:59pm PST (the “Offer Period”) and in the U.S. only. 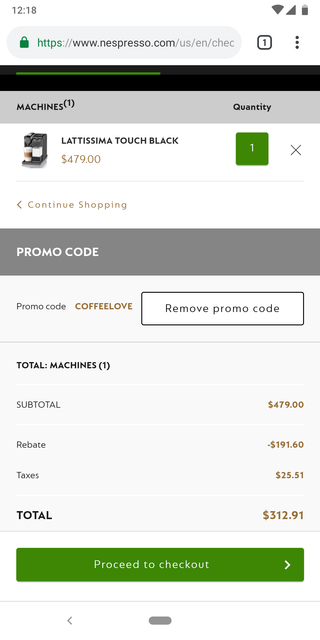 Offer subject to producing valid Use Code exclusively at www.nespresso.com, Nespresso® Boutiques, or by calling Nespresso® at 1-800-562-1465 - while supplies last. This is a Nespresso® promotion. Offer cannot be combined with any other Nespresso® discount or promotion. Offer is limited to the purchase of up to five (5) qualifying coffee machines per customer during the Offer Period. Void where prohibited or restricted. Consumer must pay applicable sales tax. Offer cannot be applied as a credit and is not valid towards machines previously purchased and/or exchanged. No cash value. Fraudulent or duplicate requests are void and will not be fulfilled. Offer not valid toward purchases of Aeroccino+, Aeroccino 3, Aeroccino 4, Barista Recipe Maker, accessories, capsules or Nespresso® Business Solutions machines. This offer may not be published without Nespresso® permission. Nestlé employees or already discounted partners are not eligible for this Offer. All trademarks are owned by Société des Produits Nestlé S.A., Vevey, Switzerland. do people here use their Nespresso machines on Pesach, does it need to be kashered? i am not your LOR but no it doesn't need. how could i pass a Pesach without my machines !?!? Even if you would be able to use it, at the very least you would have to thoroughly clean it if it is kept in a place where you have chametz throughout the year. Of course I clean it .. he's question was if it was needed to be kashered ..